*Note* This post was composed a good 3 weeks ago, and is just now being made public. There is no shame in this, for I have declared that this year would be a year of receiving whatever opportunities for blogging that come my way, rather than trying to force them. Cheers to every delinquent blogger, who is now feeling better about themselves due to me being far more delinquent. When you’re pregnant with your seventh child and every single day you do more cleaning and cooking and laundry and preparations than most people, your expectations for yourself to engage in thoughtfulness, gift giving, and Christmas card sending goes waaaayyyyy down. And any extra capacity was spent on the Restoration Campaign and the Pick it. Wrap it. Give it. Christmas gift outreach for our community. So if you’ve sat there wondering why you didn’t get a package in the mail or even a Christmas card from us….there’s the reason. 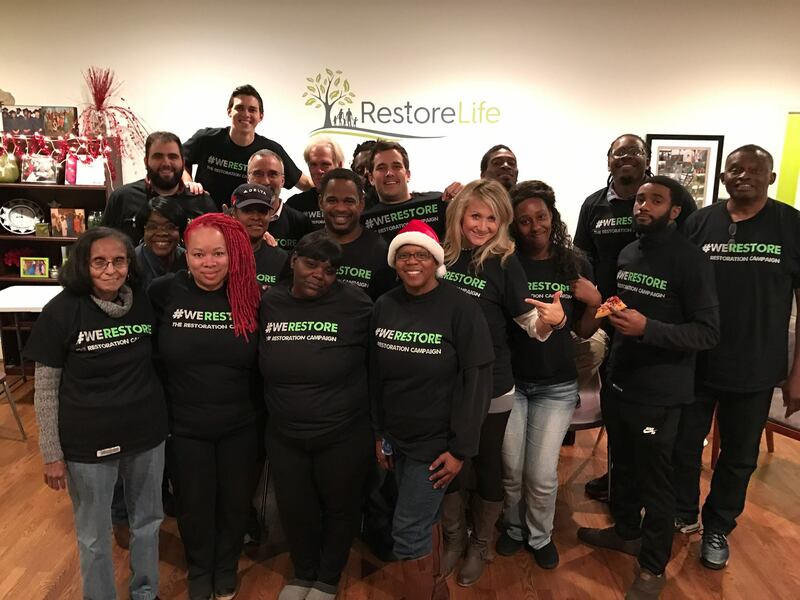 The Month of December we ran an online campaign to raise funding for Restore Life and its partners….God brought in OVER the $30,000 goal to fulfill the dream of dignified housing, job development and flourishing families in the Grove Park community and Atlanta. Click here to see what this online fundraiser supported. Wonderful volunteers from Shalom City and other area churches collected new and used gifts, set up a Christmas “store”, priced items, wrapped presents, served food and helped put on an incredible outreach to our community to bless parents with the opportunity to purchase discounted gifts for their children. I would be misrepresenting our December if we just posted pictures and details of the victories and happy times. December also brought some heart wrenching betrayal, thieving and and uncovering of webs of lies which had deceived us and our children. Several important documents and credit card numbers were stolen by people whom we had grown to trust and welcome into our home. More hurtful than the actual thieving, were the lies that were uncovered….lies that seemingly wasted our time, energy and resources on people and situations that didn’t even actually exist (in truthfulness). We cling to the promise of Genesis 50:20 ” As far as you’re concerned, you were planning evil against me, but God intended it for good, planning to bring about the present result so that many people would be preserved alive.” (ISV) We might not know the full story of what God was doing in it all, but one thing is sure, we are more committed than every to be tuning our ears to the promptings of the Holy Spirit, His leading and the input of wise counsel, so as to only walk through the “land mines” that HE ordains us to, rather than foolish ones we stumble across because of being so focused on the “mission” instead of the voice of the One who is directing the mission.